Luke Esposito scored the winner at 1:46 of the second overtime period to lift the Chilliwack Chiefs past the Surrey Eagles 4-3 on Sunday evening at the South Surrey Arena. With the win, the Chiefs have now taken two of three games against the Birds in the season series between the two teams. Josh Halpenny made 33 saves to pick up the win in his first BCHL start for Chilliwack. However, Halpenny didn't get off to a great start. Less than five minutes into the first period, Brett Mulcahy opened the scoring for Surrey, beating Halpenny between the legs with a slap shot from centre. 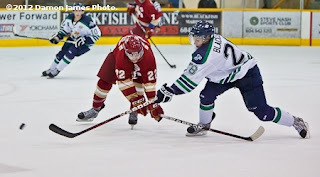 1:23 later, the Eagles went up 2-0 when Michael Stenerson found Devon Toews in the high slot, and the 18-year-old defenseman fired a wrist shot past the Chilliwack net minder to give the Eagles the two goal lead. In the dying seconds of the opening frame, Cooper Rush managed to beat Surrey goaltender Michael Santaguida with a shot from the top of the left circle that found its way across the line just as the horn sounded, pulling the Chiefs to within one after 20 minutes. In the middle frame, Chilliwack battled back to take the lead. Spencer Graboski tied the game at 11:48, netting his second goal of the year. In the late stages of the period, the Chilliwack power play came to life after going 0-for-4 up to that point. Ben Israel picked up a rebound at the left post and knocked it into the net while Mulcahy looked on from the sin bin, and the Chiefs took the 3-2 lead into the intermission. The Eagles managed to equalize early in the third when Demico Hannoun ripped the puck past Halpenny from the high slot to even the score at 3-3. Despite a number of chances for both teams in the latter part of the third, the game remained tied and overtime would be required. Neither team could find the net until Esposito scored the winning goal, deking into the slot and beating Santaguida above the blocker to end the game. Surrey failed to capitalize on the man advantage for a fifth straight game, despite getting six opportunities. The Eagles are 0-for-24 on the power play over that five game span. The Birds return to action on Friday when they host the Prince George Spruce Kings. The puck drops at 7 o'clock at the South Surrey Arena. For tickets, call 604-531-4625.